inscription: Bottom left corner has: "Graphoto by Noggle (c) 1969 / $1 to Graphoto POB 15304 San Francisco, Calif. 94115". Bottom right corner has: "Sheep '69" , Black Sheep Logo, and "Produced by Stone Kingdom Syndicate". Top edge of poster has text: "Everybody get one and stick it up where it can be seen by everybody else." Below poster has ornate black and white border with leaf like shapes reminiscent of American currency. At the top of the border is a pendant with a green image of a marijuana bud and the green text: "God Save The Seeds !" Below is a photomontage of a man in uniform holding a tuba (in black and white) standing in front of several marijuana plants (in green and white). 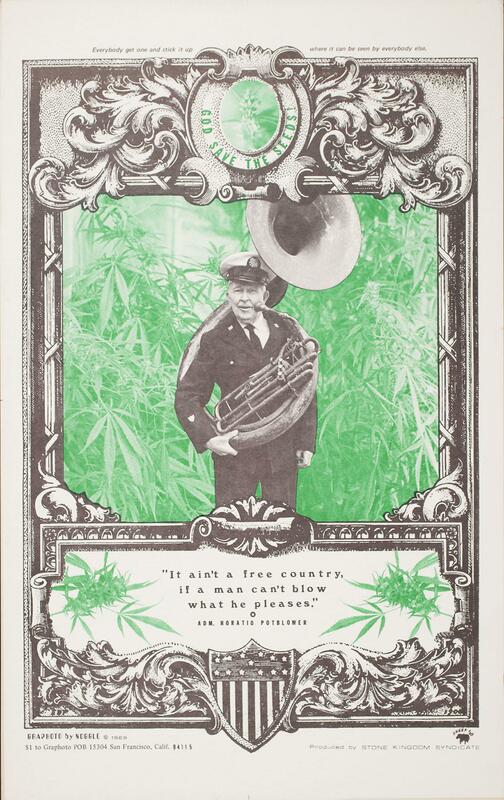 At the bottom of the poster two Marijuana buds flank the text: " 'It ain't a free country, / if a man can't blow / what he pleases.' / ADM. [Admiral] Horatio Potblower".